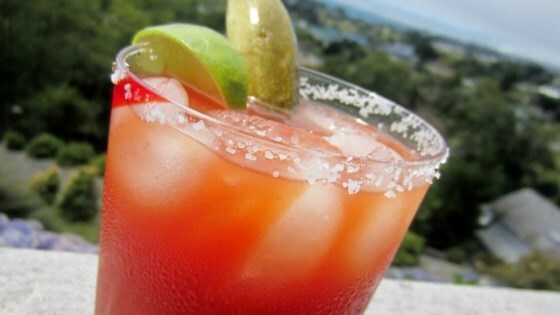 "Bloody Marys are perfect for that Sunday morning brunch. This can also be served as a virgin bloody Mary (minus the vodka)." In a large pitcher, stir together the Bloody Mary mix, horseradish, dill, hot pepper sauce, and dill pickle juice. Taste and adjust seasoning if desired. In a shallow dish, stir together the kosher salt, pepper and celery seed. Pour the lime juice onto a saucer. Dip each glass into the lime juice to coat the rim, then into the spice mixture. Fill each glass with ice. Pour one shot of vodka into each glass if using. Fill with the Bloody Mary mixture. Garnish each glass with a wedge of lime and a dill pickle spear. I have had many a Bloody Mary, but had never tried pepper & celery seed with the rimmer salt. It was PRIMO !! Forget the pre-made mix, use a good quality tomato juice. Add your own worchestire, lime juice too taste. FORGET THE HORSERADISH let people add their own. Adding it early to the mix ruins it. Awesome. I love it. It’s a good drink. Wow, that's easy! Why didn't I think of using bottled Bloody Mary mix? It was tasty, but not really that easy to make. I'll post my own recipe later.